The legislature continued to move at a rapid pace this week, with bills coming in and out of committee quickly. The House voted to override the Governor’s veto of the budget, making the spending plan law. Legislators also passed a budget technical corrections bill to address some oversights in the original budget and make other adjustments. Both chambers worked well into the evening most nights, and held a rare Friday session. Given the late work week, the NCACC will likely send a supplemental update to the brief early next week. Clarify Prevention/Emergency Management Act – Please contact your legislators with your feedback and concerns. Land Use Regulatory Changes – Please contact your legislators with your concerns. Uniform & Expanded Early Voting Act – Please contact your legislators about the impact this bill may have in your county. This week, the General Assembly approved legislation altering the method by which education funding disputes between boards of county commissioners and local boards of education are handled. Repealing the statutory authority that allows a local school board to file suit against a county board of commissioners over county appropriations for education has been one of the NCACC’s top legislative priorities in recent years. As of Friday morning, the bill resides in the Senate for consideration. The bill passed the House and Senate this week and is now on its way to the Governor for his consideration. For the first disputed budget year, appropriations would be the previous year’s expenditures for operating expenses adjusted by changes in the projected average daily membership in the school district and changes in an employment cost index of salaries and wages for school personnel. An unresolved dispute during the second consecutive budget year would result in the same default funding mechanism described for the first disputed budget year. If a funding dispute cannot be resolved during a third consecutive budget year, the default funding mechanism adds an additional three percent growth rate to the mechanism used during the previous two years. Previous versions of the legislation included capital outlay appropriations in the funding formula. The NCACC discussed counties’ continued concerns regarding how capital funding was treated under the legislation with bill sponsor Rep. Craig Horn (R-Union), and it was agreed to remove capital from the funding formula. Although the removal of capital from the funding formula means the dispute resolution process for school board and county disputes over capital remains unchanged, the legislation directs a working group to study a mechanism for calculation by formula or other means to resolve disputes related to capital outlay as alternatives to litigation. That working group will be convened by the Local Government Commission and the UNC School of Government and include representatives of the North Carolina Association of County Commissioners, the North Carolina School Boards Association, and the North Carolina Association of School Business Officers. The working group is directed to report its findings, recommendations, and any proposed legislation to the Joint Legislative Education Oversight Committee by March 30, 2019. NCACC thanks Sen. Tommy Tucker and Rep. Craig Horn for their leadership and efforts in working to address this key issue for counties. Senate Bill 723, Clarify Prevention/Emergency Management Act, appeared as a proposed committee substitute for discussion only in the Senate Judiciary committee on Tuesday afternoon. The bill would establish that the prevention of human-caused emergencies/violent acts is within the scope of the North Carolina Emergency Management Act and under the purview of the Division of Emergency Management. The NCACC spoke when the bill was heard for additional discussion on Thursday and expressed willingness to work with the Division of Emergency Management on this issue as well as raised a few concerns related to implementation. The bill includes a broad directive for prevention that raises questions associated with liability, as well as the role of the Division of Emergency Management as the lead to oversee a plan for local building safety. The bill passed Judiciary and was re-referred to Senate Rules. The NCACC will continue to monitor this issue. In the meantime, please share any concerns your county may have with your legislators. 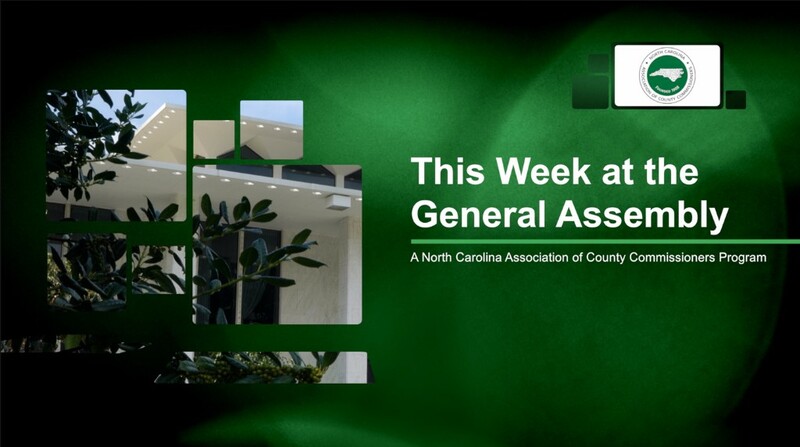 The House concurred with Senate changes to H948, which addressed concerns raised by the NCACC regarding liability from the engineer inspection option as well as issues with the original process for activating the new inspector pool in the NC Department of Insurance. The bill as presented to the Governor allows for engineer inspections of certain individual parts of a residential construction, but not entire systems of a building, and puts additional liability protections in the law for counties. The bill directs a number of reports on inspection fees and activities, and includes exceptions and notice requirements for triggering the marketplace pool of inspectors. The bill passed the Senate 47-0 on Wednesday and the House 104-0 on Thursday. On Thursday, the legislature passed additional clarifications to water and sewer system development fees outlined in legislation passed last year. House Bill 826 changes the minimum planning horizon from 10 to five years for water capacity needs under the fee authority, effective for fees established or updated on or after October 1, 2018, and clarifies the timing for collecting the fee. The bill also clarifies that system development fee revenue can pay for revenue bonds, and directs the Environmental Management Commission to update water supply rules to help calculate system development fees in the next round of analysis. The bill is on the Governor’s desk for his consideration. While other changes to system development fees that would negatively impact counties were discussed, the NCACC addressed these with the stakeholders and does not anticipate additional modifications this year. Counties should review the system development fee law carefully and ensure they are in compliance for any fees imposed after October 1, 2017, or conform to the requirements by July 1, 2018 for any fee adopted before October 2017. This week the Senate moved legislation (H507) that would significantly change land development law and negatively impact counties. The bill would nearly eliminate the county’s ability to ensure land development projects meet certain performance standards for infrastructure like roads, water, and sewer. Counties are already challenged in handling stranded subdivision roads, and further limiting performance guarantees will potentially exacerbate this problem. The bill could also incentivize land use litigation and circumvent a county’s ability to make land use decisions. As of this writing, H507 resides in the Senate Rules Committee. The NCACC sent a legislative alert earlier this week about the changes in this bill, and urges county leaders to contact their legislators about their concerns. Legislation to support internet access received a positive vote in one House committee this week. House Bill 1086 passed the House State and Local Government Committee on Tuesday unanimously with members offering their enthusiastic support for county efforts to expand broadband access. H1086 is a local bill that would allow 14 counties in the western part of the state to build infrastructure for high speed broadband and lease it to private internet service providers. The bill would not authorize counties to provide internet service. H1086 seeks to address a long standing NCACC goal to improve broadband access in underserved areas. During the committee, other members expressed a desire for similar fixes to the lack of broadband in their own districts. Under the state constitution, a bill that affects more than 14 counties must run as a statewide bill which comes with additional procedural restrictions. The NCACC also supports a statewide bill to help counties expand internet access in partnership with the private sector. The bill passed the committee and was re-referred to House Finance. NCACC thanks Reps. Josh Dobson, Kevin Corbin, Michele Presnell, and David Rogers for their work on this issue and looks forward to continued efforts to improve broadband access across the state. Senate Bill 325 would change the time period for early voting, establish hours for one-stop voting sites and require county boards of elections to submit an annual report on voter list maintenance efforts. Previously, the parameters for early voting gave counties more flexibility. The NCACC has concerns about how this legislation limits that flexibility. S325 passed the House and Senate on Friday and is on its way to the Governor. Please contact your legislators about the impact this may have in your county.